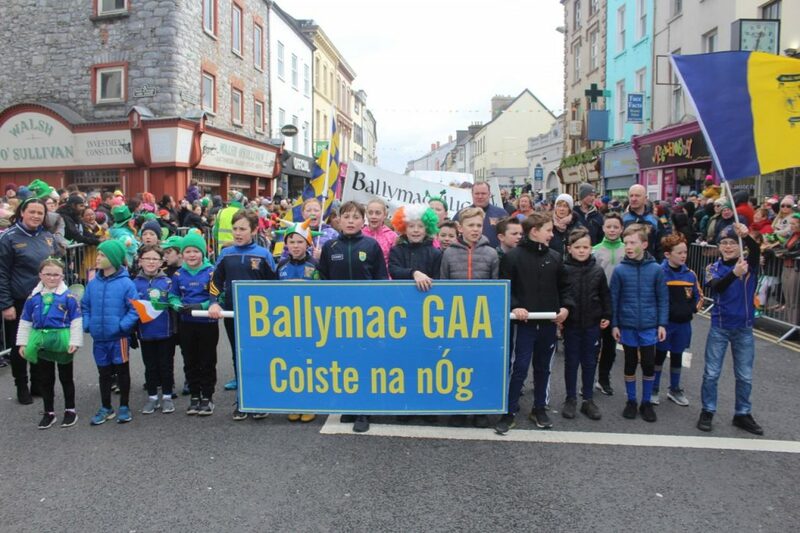 Membership for Ballymacelligott GAA Club for 2019 is online only and the closing date is looming. We as a club must register our players and Members for 2019 prior to 31st March 2019. This means membership has to be as soon as possible to have the necessary registration done prior to 31st March. Only a Full Member who has paid their annual Club subscription by the due date set by the Executive Committee of the Club (which shall be prior to March 31st) shall be eligible to vote at, nominate for, or seek election to the Executive Committee at any following General Meeting of the Club in the membership year. Only players who have paid membership can play for the club. All players, administrators and coaches/mentors have to pay membership. Membership can be paid via club web site: The link is on the front page. Membership can also be paid via the app Myclubfinances that is available from the app store. The online payment complies fully with data protection legislation. · and Sunday 31st March for our U6 Boys and Girls: at 11.00am in our main pitch. Scór na bPáistí; The County semi finals of Scór na bPáistí for our Club take place on Saturday next the 23rd March @ 4 pm at St. John’s School Hall Castleisland. We wish every success to the following who are representing our Club: We hope you have a great night and are all happy with your performance on the night. Emma Ní Dhálaigh, Ri-Ann Zhang, Maire Ní Chonchúir,Mairead Ní Scanláin ,Rachel Ní Ghealbháin, Cáit Tornóir,Conor McCarthy, Laura Ní Cheallaigh and Alicia O’Connell. County Finals are scheduled for Saturday 6th April at Glenbeigh Community Centre commencing with Tráth na gCeist at 2 pm and main competitions at 4 pm. The Ballymac GAA club wishes to express our appreciation to Josephine Fearns our Scór Officer for the fantastic work she does for Scór in the Club. Under her stewardship Scór has grown from strength to strength in the club. We are very grateful to all our Lotto supporters & Sellers. The eighth annual County Clean Up will take place this year on Saturday, 13 April and a call has gone to individuals, clubs and communities across the county to take part and help make the county spick and span. The Half Way Shophave the green bags etc. in stock at the moment. Volunteers can pick up these at their convenience and collection points will be designated around the county to ensure that all litter gathered is disposed of. The Senior Ladies played John Mitchels in the opening round of the County League on Monday 18th of March in John Mitchels GAA Complex. It was a high scoring and fast paced game. At half time the teams were level, but John Mitchels pulled ahead to secure their first win of the season. The team was as follows: Robyn White, Naomi O’Sullivan, Niamh Rahilly, Veronica O’Donnell, Caoimhe Carroll, Una Kerins (captain), Claire Godley, Ellie McElligott, Aisling O’Connell, Eve Creedon, Lisa Curran, Grainne Kerins, Emma Sweeney, Mary Sugrue, Ellie Sugrue, Áine Rice, and Rachel Godley. Next game V’s Currow is on Sunday 24th of March in the Mary Jo Curran Competition. The U18’s were due to play Scartaglin on Saturday 16th March in the first round of the County League; however the game was postponed due to pitch closure. Next game V’s Finuge/St. Senans on Friday 22nd of March @ 6pm in Ballymac. Ballymac U14s girls kicked off their U14 Div 1 Co league campaign today in John Mitchels GAA complex due to Ballymac pitch being closed. The first 15mins of the game saw both defences on top and the score 1pt a piece. Ciara Palmer from a free and Shauna Tagney from play for Scart. Muireann Walsh & Muireann Rahilly were becoming influential for Scart and 2 goals for Scart saw them lead. However, Ballymac rallied and with Roisin Rahilly coming forward from centre back we created quite a few chances. Despite Niamh Lynch doing her part in taking 2 good goals we left quite a few opportunities behind us , lacking conviction when shooting. Scart added a goal and 3 pts before half time to lead at the short whistle by 3-4 to 2-1. A good start to the 2nd half saw Ella Quirke set up Ciara Palmer for a good score from play. Couple of more goal chances came our way but again weren’t taken. Scart were defending well and attacked with purpose putting passes together well and were taking their opportunities. Despite the best efforts of Kerry Hennessey, Charlotte Geary, Anna Collins , Roisin Rahilly, Ciara Palmer and new addition Ciara Kerins Scartaglin ran out fully deserving winners on the day. TEAM : Kerry Hennesey, Alexia Weiss, Sarah Mason, Abbey Leahy, Nicole Walker, Roisin Rahilly, Charlotte Geary, Ciara Palmer( 0-4) Ella Quirke, Anna Collins, Ciara Kerins, Kate Feeney, Laura Sugrue, Niamh Lynch (2-0) Cristina Ensenyat. Subs : Alice Brosnan, Lauren O Connor, Roisin Raggett, Jill Quirke, Alli Tarrant.